I have been wanting to try Lotus Chinese Eatery in Huntington Beach because people online raved about this place. It's suppose to be Islamic Chinese cuisine. As a family we decided to come here so that we can try something new and we were too lazy to drive to Rowland Heights. It didn't take long for us to get here. We were sat down immediately. There were only a few tables when we got there but then it started to get busier. We debated for a long time on what to order. Since they have lunch specials every day, we all decided to get lunch specials. They bring you a cup of soup. It was Corn Soup, which is Egg Flower just with Corn added in. The taste was fine, but I make a killer Chicken Corn Soup or a Seafood one. ^_^ We were all fine with the soup. We were not planning to get the Big Sesame Thin Bread with Green Onion because we were not really getting dishes that are suited for the bread. Despite 3 of us not wanting to order this, my Mom insisted on it so we just got an order. My family enjoyed the amount of green onion used, but I thought it was a little too salty for my taste. They did complain about it not being thin at all because it still had some thickness to it. 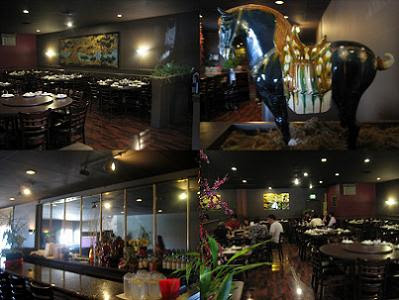 We all agreed that the place in Rowland Heights is much better tasting. The other dish I really wanted was the Hand-Cut Lamb Noodles. Ever since Ms. Lin took me to Fatima, I have been a huge fan of home-made noodles. The flavor here was not too bad and the noodles were fine although cut weirdly. This was probably my favorite dish of the day. We all agreed that the lamb meat was SKETCHY. It's just tiny shaved morsels that don't even form a solid piece. This dish was mainly Eggs and Vegetables stir-fried with little Lamb. The taste was fine, but I question certain things... hmmmm. My Dad automatically ordered the Hunan Spicy Lamb lunch because he loves spicy. This dish barely had any lamb at all. It was full of filler vegetables. Again the meat was tiny slivers/morsels of meat. How come there isn't one solid piece of meat? I feel like there must be something wrong with the meat. The flavor was so-so and not spicy at all. It was a big disappointment. Usually I decide for my Mom what dish to order. For her order we got Lamb with Satay Sauce. When the dish came out it almost looked like over-shredded pork. It's an illusion as well because there was barely any meat and tons of vegetables on the bottom. The satay flavor was light. Okay, even my Dad can make better satay dishes. They really missed the mark on the lamb dishes. We were greatly disappointed with everything. Everyone pointed the blame on me since I did the research. I must say the internet has failed me! BOO! All in all this place wasn't good. Even I who hates driving would rather go to Rowland Heights next time. As a funny tid bit, I must say it's survival of the fittest when eating with my family! I am an extremely slow eater because I like to take in the flavors and savor the taste. Even though I liked the noodles, my Mom scarfed 2 bowls down before I even ate 3 chopsticks full. Let's just say I went home hungry, but that is okay because the food blew! I told Ms. Lin we should have ordered their Spicy Tendon and Beef dish, but our parents objected. Maybe that would have been better, but judging by the other stuff we had... I wouldn't bet on it! BLECH!